This year Imperial Sugar, our Gold sponsor, was kind enough to supply us with their fantastic sugar. I received twelve 2 lb. bags of brown sugar and twelve 2 lb. bags of powdered sugar. How great is that! Even though this is #Choctoberfest and the likely ingredient to use this week would be of course chocolate, I thought what better way to use brown sugar than to make a pan of blondies. After all blondies are the cousin to their famous and chocolaty cousin, the brownie. Besides using Imperial Sugar for this recipe, I also used Nestle’s ‘Seasonal Batch’ Maple Flavored Chips , a new seasonal flavor baking chips. 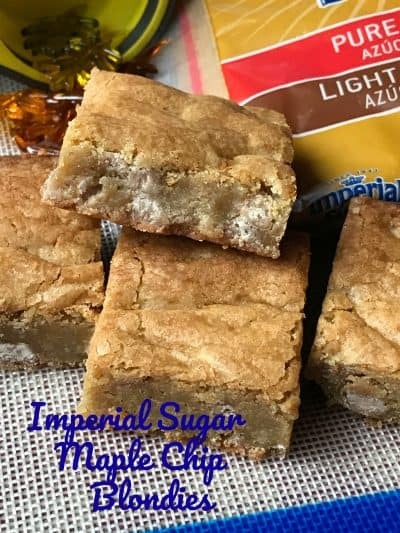 Maple chips added a warm mapley flavor to these already buttery blondies. Blondies get their great flavor from the butter and brown sugar used in all blondie recipes, turning them into a delicious pan of butterscotch, maple goodness. 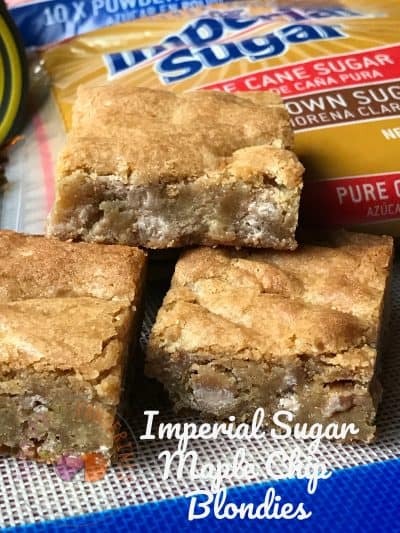 The best tasting blondies, in my humble culinary opinion, comes from using butter (no margarine please) and Imperial Sugar. Heat oven to 350 degrees. Line an 8-inch by 8-inch metal baking pan with aluminum foil or parchment paper. In a medium bowl, stir melted butter and brown sugar until blended. Add the egg, vanilla extract, maple extract and salt Stir vigorously until smooth. When the batter looks well blended, add the flour and stir, then beat with a wooden spoon for 40 to 50 strokes. (The batter will be thick). Fold in the maple chips and pecans. Spread the batter evenly into lined pan and bake 20 to 25 minutes and the edges look browned, but the middle looks slightly underdone (the middle will continue to cook while it cools). Place the pan on a wire rack and let the blondies cool in the pan. Cut into 16 squares. 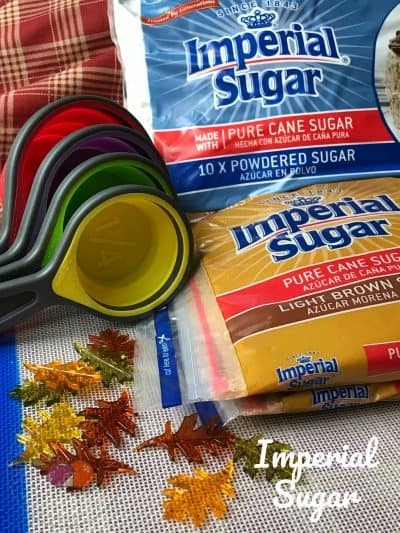 I want to Thank Imperial Sugar for Sponsoring #Choctoberfest 2018. For more Maple goodness; Canadian Maple Syrup Pie and Maple Facts, Maple Syrup Cinnamon Rolls and Maple Nut Fudge. I also had the same problem with it not setting up. I did not use spray or foil in my 9 x 9 glass baking dish. I did add a cup of chopped walnuts to the batter which should have made it drier not wetter. I do have another bag so I might just try it again with less butter and bake in my 9 x 13 nonstick pan. Also, 1 bag of chips is 10 oz which is 1-1/3 cups not 1-1/2.